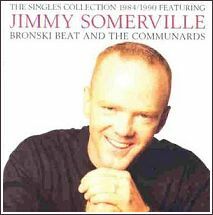 Jimmy Somerville was in Australia for shows in Melbourne and Sydney in 2006. The Age had three articles about him, on 23 February, by Michael Dwyer, 26 February, by Guy Blackman, and 1 March 2006, by Steve Dow. Somerville is worried that gay people these days are taking their hard-won freedoms for granted. Jimmy was interviewed by the excellent Phillip Adams on the award winning Late Night Live show on ABC Radio national on 20 February.